Heat 12-inch nonstick skillet over medium heat. Add chicken; sprinkle with salt and pepper. Cook 6 to 8 minutes, turning once, until brown. Remove chicken from skillet; place on plate and cover loosely with foil to keep warm. To same skillet, add sugar snap peas, carrots and water. Increase heat to medium-high; cover and cook 4 to 6 minutes or until crisp-tender. Meanwhile, in small bowl, mix marmalade and cornstarch until well blended. 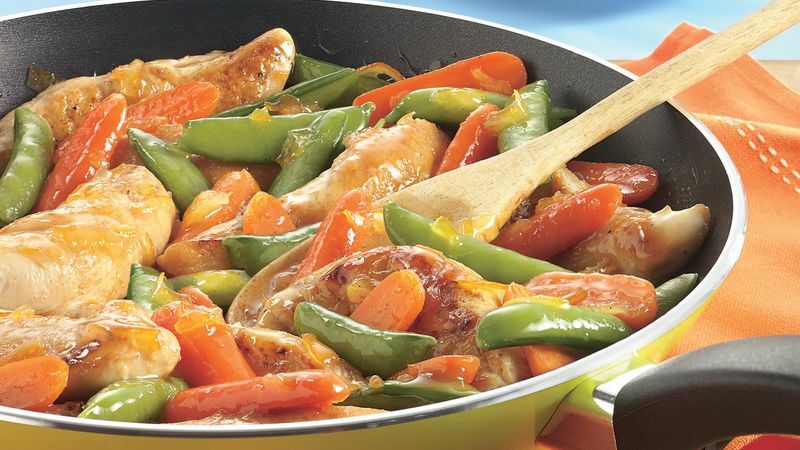 Return chicken and add marmalade mixture to skillet; cook 2 to 3 minutes longer, stirring occasionally, until chicken is no longer pink in center and sauce has thickened. If the baby-cut carrots are not similar in size, be sure to cut them all to a similar size to ensure they are all crisp-tender when cooked.